e-Learning Acupuncture: iPhones are for the birds! iPhones are for the birds! In 2006, I blogged about iPods as training aids in sports. Since 2006 there has been many examples about iPods being used as a just-in-time performance support aid for various training and educational contexts. I was recently at the Eastern Ontario Symposium for Educational Technology in Ottawa and a presenter from the University of Ontario Institute of Technology showed how the nursing school was using a PDA to help nursing students. These students on the floor had access to just-in-time resources on the PDA (textbook, drug guide, etc.). In addition, these students were able to log their training competencies as they complete them, instead of logging them once they arrive home for the evening. A lovely example of how a portable device can enhance a learning environment by both being a resources for information and by storing data for later use. So by now you’re probably asking yourself, what does this story about nursing students have to do with the title of this posting? (i.e. having anything to do with and iPhone or with birds). Well, I’m sorry to report that it really has very little to do with it. However, I thought it was a nice little introductory story to what I want to describe next: BirdJam! Yuppers. No typo here - definitely BirdJam. 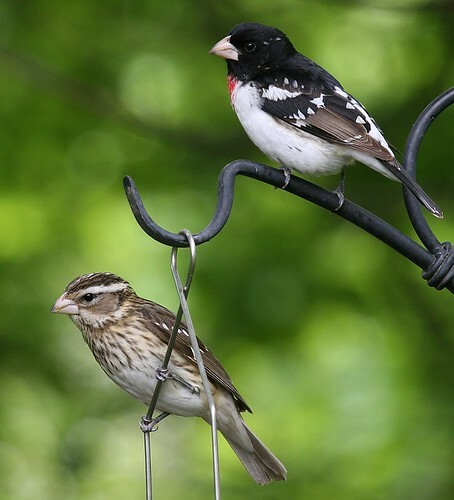 13May06-RoseBreastedGrosbeak-Pair, - photo by Eric Tremblay. Bird watching is a popular hobby and many companies make resources for the avid birdwatcher. A myriad number of field guides and a long list of bird song CDs are available. I recently came across an application that uses an iPod, or an iPhone, as a performance support for birdwatchers. Paper-based field guides with photos have routinely been used at the time of a bird sighting for identification purposes; however, operating a series of birdsong CDs is much harder to manage when you are out in the field. That’s where BirdJam comes in. With what I consider to be a very elegant solution, BirdJam will transform your iPhone, or iPod, into a virtual field guide which integrates together both photos and the accompanying bird songs. BirdJam is a piece of software that converts data from the popular Stokes Field Guides for Birdsongs into a format that leverages the unique features of the iPhone and iPod (such as cover flow, and fast title searching, etc.). The result is a portable encyclopedia of photos and songs that is fast and easy to use. The technophilic bird watcher will salivate at the first sigh of BirdJam! If you don’t already have your own iPod or iPhone don’t worry. They will sell you a pre-loaded iPod ready for the field right out of the box. Several different add-ons are available, so not only can you obtain photos and audio of bird songs from eastern and western regions of North America, but you can also obtain data packs for birds native to Mexico and Costa Rica. I would bet that in coming months that BirdJam, and it’s partners, will continue to expand its available selection. Much of our education and learning takes place outside the classroom. BirdJam is one example of a tool that creates a just-in-time performance supports for birdwatchers. Just another example of how people are thinking outside the box to make learning a lot easier for us all.